The Pointing Dog Journal just sent a great little article on taking care of our hunting dogs during the winter. Here’s the link, http://email.villagepress.com/pub/PDJ/110202/Feb11_Winter_Season_Tips.html–worth the quick read. 1. Coats – Hold on now, before you go rolling your eyes thinking coats are for those fancy, city-slicker breeds…I have a short-coated breed. AND, a breed with very little natural insulation. Have you ever had your hands on a well-conditioned Vizsla? You can feel muscle and even the skeletal structure. What you don’t feel is fat or an undercoat. This impacts this breed’s ability to keep warmer in the very cold, harsh winter conditions. 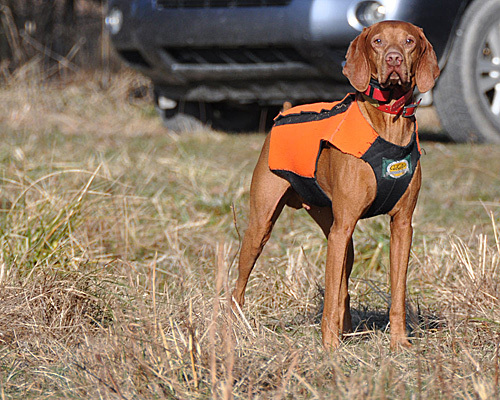 In addition to coats helping to keep our crew comfortable when out hunting, training, or even during their off leash runs, the coats–especially the neoprene “hunting vests”–help protect their bodies from getting too banged/cut up. After multiple days of hunting, my Vizslas get cut up and bloody (depending on the cover we hunt of course) as they dive into the places the game they seek will be holding. Their neoprene vests take a lot of the punishing scrapes the thickets, branches, and barbed wire fences deliver. Fewer cuts on their bodies help them recover faster and be more comfortable overall. This may sound like we coddle our hunting dogs. Perhaps we do. If putting coats on them in cold, wet conditions is coddling then I’m okay with this. I think about how hard they work–how much heart they put into the hunt. I respect this and will do my part to keep them as comfortable and as healthy as possible so they can thrive and hopefully hunt comfortably into their golden years. Our Vizslas have a couple of different coats. For hunting in cold weather (and for snowshoeing), they wear blaze orange neoprene hunting vests from Cabelas, http://bit.ly/e3GiYy. We’ve tried several iterations of these vests over the years and are very impressed with the current version. First, the thick velcro strap along the top of the vest allows quick “on and off”. This is important when trying to dress a very excited bird dog! Second, we like that the vests can be customized to some degree. You can cut the armholes (and we recommend you do!) so the material doesn’t rub the under arm area on your dog. Trust me, you don’t want any rubbing in this area–blisters, puffiness, red-soreness makes for an uncomfortable dog. You can also cut out the under belly area depending on your hunting dog’s gender. The thickness of the vests are perfect for colder weather but be careful about putting them on your dog when it’s too warm. 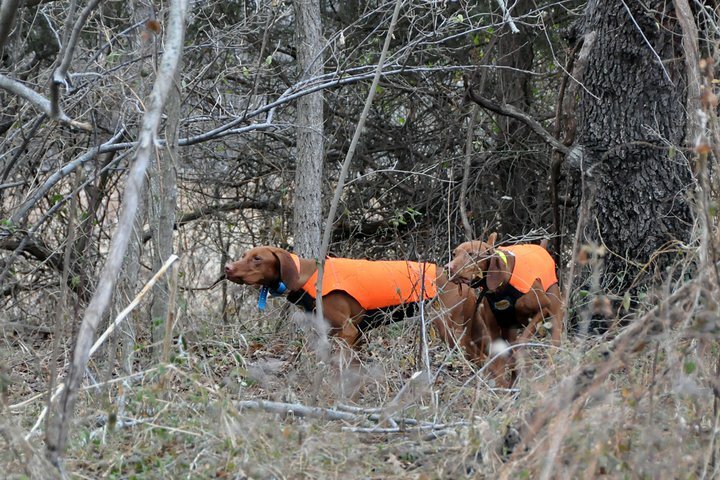 Especially, if your hunting dog has a thicker coat than Vizslas. They can heat up quickly. We’ve started our dogs in the vests and as the day warms we pay close attention so the dogs don’t overheat. 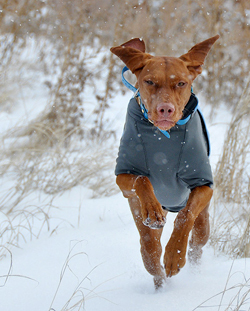 The coats our Vizslas wear in the city or during their off leash runs are from ruffwear.com. Love, love, L-O-V-E this company! Ours have a couple of different styles: K9 Overcoat and Cloud Chaser. The Cloud Chaser provides more coverage and is good for wetter conditions. I do fault the coat in how it fits around the upper arm. The elastic can be too snug and rub the dog’s upper arm. It seems a redesign in this area would be simple enough–Hey Ruffwear, give me buzz and I’ll share my idea! But, because we like the coat in every other way, we just modified this area ourselves. The K9 Overcoat fits more like a vest and provides good coverage in lighter treks or when the conditions aren’t as damp/wet. Next, put on the Ruffwear boot while your dog is standing. Make sure you have the correct size for your dog’s feet. If the boot keeps turning when your dog runs, you likely have too big of a size. Also, make sure you really cinch the velcro strap so the fit is tight. Last, with duct tape, start wrapping over the boot (just above the tread on the bottom of the shoe) all of the way up over the vet wrap. Again, snug enough but not tight so as to cut circulation. Make sure you have a pair of scissors so you can quickly cut away the vet wrap/duct tape mess at the end of the day. 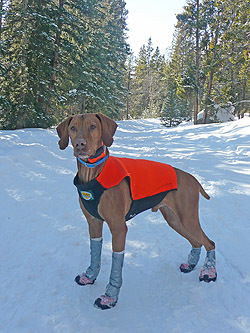 Ruffwear does sell socks that are supposed to help keep the boots on and prevent chaffing. We’ve seen these in use on some of our friends’ dogs (I think we even tried them) and remain unimpressed. Our vet wrap/duct tape deal seems to work better, especially if your dog will be tromping through deeper snow. It keeps the snow from getting into the boot and compacting around the dog’s leg. I can only imagine how uncomfortable this would be! In addition to the boots protecting a dog’s feet from injury, they also protect from frostbite–allowing your dog to be out in the elements comfortably for longer periods of time. I recall watching a special on the Discovery Channel about how wolves feet were different than the feet of our domesticated dogs. Wolves feet are designed to prevent frostbite and also allow the animal to move over the snow more easily. Our domesticated dogs have lost this efficient design after years of evolution.